Crate & Barrel just released a bunch of new items in their outlet store, and are offering up to 60% OFF for a limited time. Bed and bath, housewares and furniture, pillows... you want to decorate and they got it in stock. Pick it up at your local store for free or have it delivered for just $5. 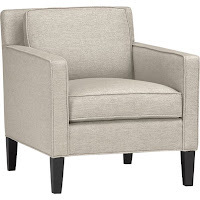 For instance, this high-end Vaughn chair in the picture is just $500 (reg. $900). Click here to view the sale at Crate and Barrel.